The FM1300 OTTO radio offering from Fluidmesh Networks is dedicated to point-to-point long distance/high bandwidth transmissions, allowing high data throughput. The FM 1300 OTTO is designed and manufactured for backhauling mission-critical video, voice and data. The FM 1300 OTTO can be used to create point-to-point links with a throughput up to 500 Megabits per second (Mbps) and links over 10 miles. Its metal enclosure shields against co-location interference. 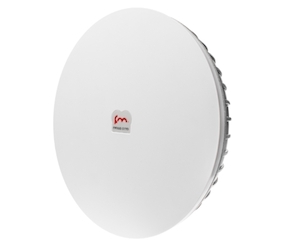 Suitable applications include: Long range links exceeding three miles without heavy dish; architecture where multiple radios are co-located (e.g., backhaul of Point-to-Multipoint); and backhaul of large networks at a data transfer rate over 150 megabits per second.